I'm cheap. If this isn't your first time here, you've probably figured that out by now. I'm also an organizing junkie. Over the years, I've found that most “organizing tools” are just a way to fill your house with “stuff”. They don't make you more organized, they just cost you money and then lay around the house cluttering it because you feel guilty that you bought it and don't use it. The best advice I can give you is to declutter first. Throw stuff out with the abandoned glee of a toddler throwing sand. It all goes out. You can't organize clutter. Once you start to feel like you're making a dent in the clutter, consider systems to store the things you own. Is it built to be durable, sturdy and last for years? If it's flimsy plastic and kind of ugly, skip it. It's not worth your money, I don't care how cheap it is. Do you know exactly what you will store in it and how much space you will need to store what you currently have? If you see the absolutely cutest storage cube that matches your new sofa perfectly but you don't know what to store in it… Skip it. It will end up as clutter, I promise. If you see a super cute shoe storage cube that holds 4 pairs of shoes, but you own 40 pairs of shoes. You either need to declutter shoes, or you need to skip this and seek a better sized option. 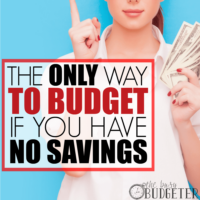 Is the function and the ease in your life worth the price of the product? Maybe you have a kitchen with tons of storage space so you're getting by fine without a pot hanger. 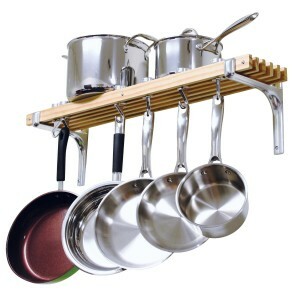 Would a pot hanger make things a little bit easier? Sure. Is it worth $45 to you? Probably not. But in a tiny little kitchen, that $45 could provide 15 years of easy cooking. Well worth the cost. 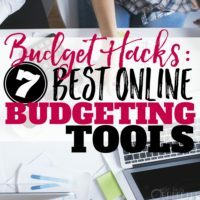 In the end, there are only 17 organizing tools that I would recommend for the budget conscious buyer. 1. 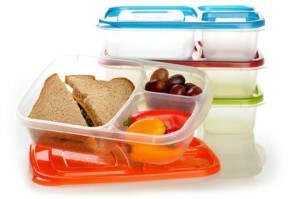 Quality food storage containers for packing lunches. Our favorites are EasyLunchboxes (by far!) but their only limitation is that they aren't completely leak proof. So you couldn't pack a stew or a soup in them. For liquid items, I recommend Sistema. Both are extremely durable, dishwasher safe, have stood the test of time, and don't have a million different tops to use (or lose). 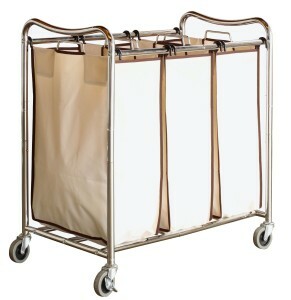 DecoBros Laundry Cart via Amazon. 2. Three section laundry organizer. This is so much easier than trying to sort out of a single laundry basket. Throw your darks in one section, your lights in another, and towels, sheets, and rags in the third. It makes me so much more motivated to get the laundry done when I know exactly what needs to go in. My favorite of the laundry carts is the Decobros found here. Homelegance storage ottoman via Amazon. 3. 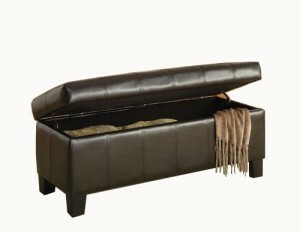 Ottoman for toy storage. Hands down the best way to store toys is in a classic storage ottoman. It will last years (well beyond the toy stage) and can grow with your kids to later hold their homework bins, your books, knitting, office box, laptop computer or lap blankets. Plus it's nice to have a place to put your feet up. My recommendation is the Homelegance storage ottoman for right now (because it's 70% off and an amazing price with 5 star reviews), but if you miss that sale, check out the Dorel Asia Chevron Storage Ottoman. Midea 3.5 cu. chest freezer via Amazon. It's almost a necessity for the price that you can get the smaller chest freezers. A tall 3.5 cubic square foot deep freezer is reasonable priced at about $150, will last for many years and can save you an incredible amount of money. From once a month freezer cooking to crockpot freezer cooking, to buying things on sale and stocking up (I have about 20 bags of frozen steam-able veggies and my favorite sriracha fries that I grabbed for about 75% off in my deep freezer right now.). My recommendation for a smaller chest freezer (plenty of storage for most families) is the Midea 3.5 cubic foot. 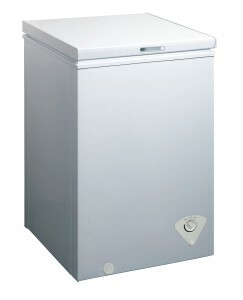 If you're sure you need a full 7 cubic foot freezer, this one is a fantastic price. This is a good solution if you have something specific to store in each cubicle. If you don't have something specific to organize, then this is just clutter. Consider keeping one of these in the front hall for book bags, homework, brief cases, diaper bags, etc. My favorite use for them is to set up a pretty stockroom in a guest bedroom. If you don't live near an Ikea, this ClosetMaid system is my favorite. If you do live near an Ikea, then the Kallax is the way to go (link goes to a large cube system, be sure to check for smaller sizes if you don't need that much storage). Prepac storage headboard via Amazon. 6. Storage bed with bookshelf. 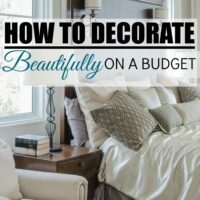 This is one of my absolute favorites but it's an investment so you may want to wait until you are planning to replace your bed anyway or see if you can find one on craigslist. 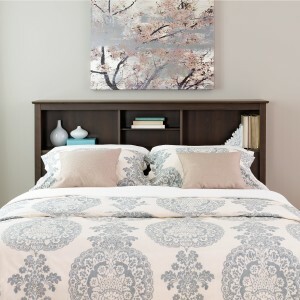 A bed with a storage headboard and underbed storage drawers is awesome! We use the underbed storage to store sheets, spare blankets and pillow cases, along with out of season clothes. On the headboard, we set up photos, library books (I take out 5 at a time), and a stationary set for cards and notes. We have the taller version of this one by Prepac (I wish we had bought this version though, ours actually has too much storage). Edsall storage shelf via Amazon. Are fantastic for making sure that you have space to stock up on things you need. 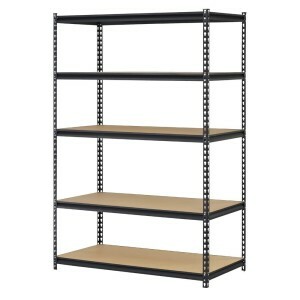 Edsall makes a 5 shelf sturdy option for a great price. 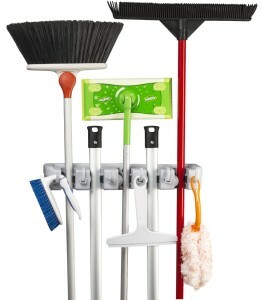 Spoga mop and broom organizer via Amazon. 8. Mop and broom organizer. Mops, brooms and our extension dust pan are a pain to leave out- we never know which corner we stuck them in and our 3 year old like to gather them and throw them down the stairs. This solves the problem and leaves the area neat and orderly. Spoga makes my favorite broom organizer, you can find it here. Woodlore cedar tie rack via Amazon. 9. Tie and belt organizer. We love having a tie and belt organizer in the closet that's easy to use. This one is number 1 rated on amazon, but this Woodlore one is the wooden one that we use and recommend (it says it's for ties, but we use it for belts, ties, and scarfs). 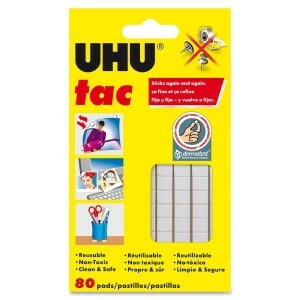 UHU Tac Poster Putty via Amazon. 10. Monkey hooks and poster putty. We use either monkey hooks or poster putty to hang EVERYTHING in the house. From pictures, gallery frames, to storage bags and backpacks. Everything that goes on a wall gets a monkey hook or poster putty. Monkey hooks don't require a hammer (you just twist the sharp end until it slips in and turn it so it anchors against the drywall) and poster putty has a strong hold and leaves no holes. You can buy poster putty here and monkey hooks here. Rubbermaid spice rack via Amazon. The spices drive me nuts. A spice rack organizer ( a few of them actually), can finally tame the chaos of your spices. The pull down racks like this one from rubbermaid are my favorite. Damalia Mail Sorter via Amazon. 12. 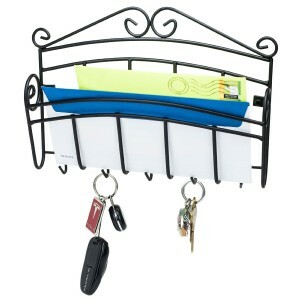 Mail and key hanger. We keep one right by the door. I'm not a proponent of stuffing the mail organizer full of incoming mail. Just sort it and get rid of it as soon as it comes in the house, but having a basket for outgoing mail, a clipboard for grocery lists or packing lists is a great idea. Especially when it can do double duty and keep your keys in one spot. My favorite is the Damalia Mail Sorter. Liberty Hook 3 Prong via Amazon. 13. Coat hooks by the door or for the back of an entry closet. Having a high quality and well hung coat hook in your entry way and/or back door is a million times better than having a coat closet with hangers. Very few kids (or husbands!) will hang their coat on a hanger when they walk in the door, but everyone seems to happily manage the coat hooks just fine. You can buy a full set like this one for a pretty entry way, but I prefer to get the 3 prong hooks individually so you can scatter them around the house as needed. We use them in our closet for tomorrow's clothing, in the bathroom for towels, in our closet for books bags etc. 14. 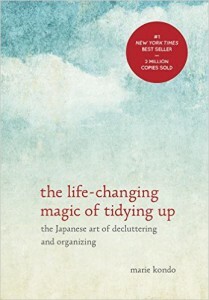 The Life Changing Magic of Tidying Up: The Japanese Art of Decluttering and Organizing. This book took the world by storm with it's infectious and motivating system to declutter your life and live more simply. Grab it from the library, or grab it from amazon here… just grab it. It's essential reading for anyone that doesn't want to live in chaos anymore. Cooks wall pot rack via Amazon. This makes kitchen storage a breeze in even the tiniest of houses. This is my favorite wall pot rack. Decobros Kitchen Organizer via Amazon. 16. 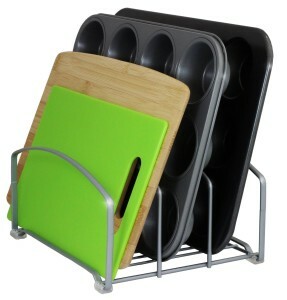 Cookie Sheet/Cutting Board organizer. This makes all the difference in keeping kitchen cabinets that don't resemble a jenga game. This is my favorite organizer for cookie sheets and cutting boards. 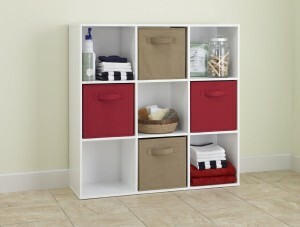 Prepac shoe storage cubby bench via Amazon. 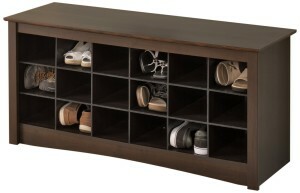 A great quality entry way bench with shoe storage will keep your shoes neat and orderly for years. 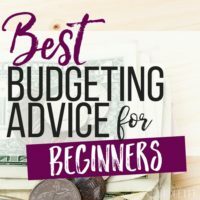 They can be a bit expensive so consider making it if you have the skills. I love this one by Prepac but others are cheap and not recommended or too expensive to justify the cost. Consider making one yourself through this tutorial if you know someone who is handy. Those are the items that I would recommend as worth your money. 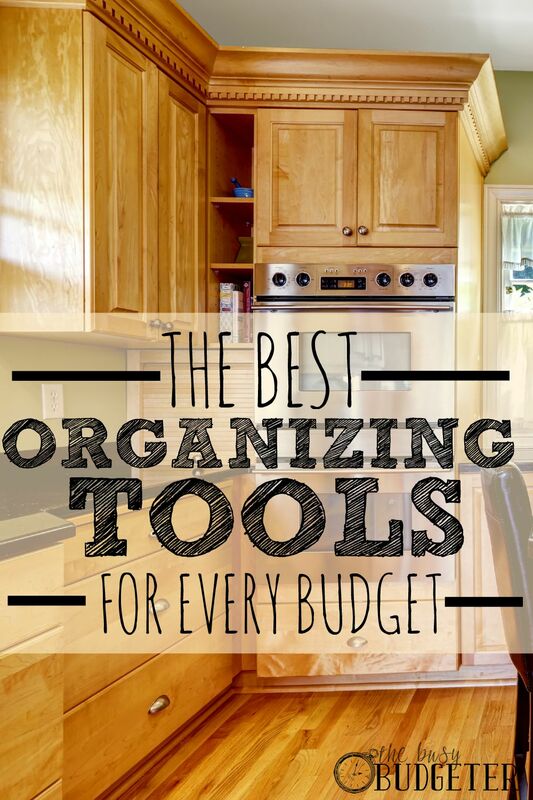 What's your favorite organizing tool? I didn’t even know some of these products existed! Getting organized with the right products will help you make the most of every bit of space whether your kitchen is small or large! We definitely agree with you in our house Columbus! Great ideas! I utilize many of these. 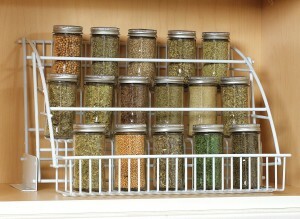 I recently bought the Rubbermaid spice rack and love it! I actually don’t even pull it down, but I like that I can see my spaces and they don’t fall off in the back of the cabinet like they did on lazy Susan’s. I also have a triple laundry sorter that has a hanging rod above and a shelf where I keep some of my cleaning items like mop bucket and extra microfiber and steam mop pads. We have a row of hooks by the front door for my husband’s jackets and caps, one in the hall for the kids stuff, and I have one in my closet for chunkier necklaces and bracelets that don’t fit in regular jewelry box. Something else I’ve utilized is large plastic storage drawers underneath the hanging clothes in my kids closets for storing things like stuffed animals, dolls, and blankets. My daughter has a spinning two-tiered carousel (from QVC) with wire baskets on her bathroom counter that holds makeup, nail products and hair accessories. Great post! I love that DecoBros Laundry Cart. Have you considered doing a garage organization post?